Love immersive escape rooms without being trapped in a room? Love solving a murder / crime? Love having 2 hours to solve it in? Love using your smartphone to solve clues or discover further clues? Love playing it where you want to play it? 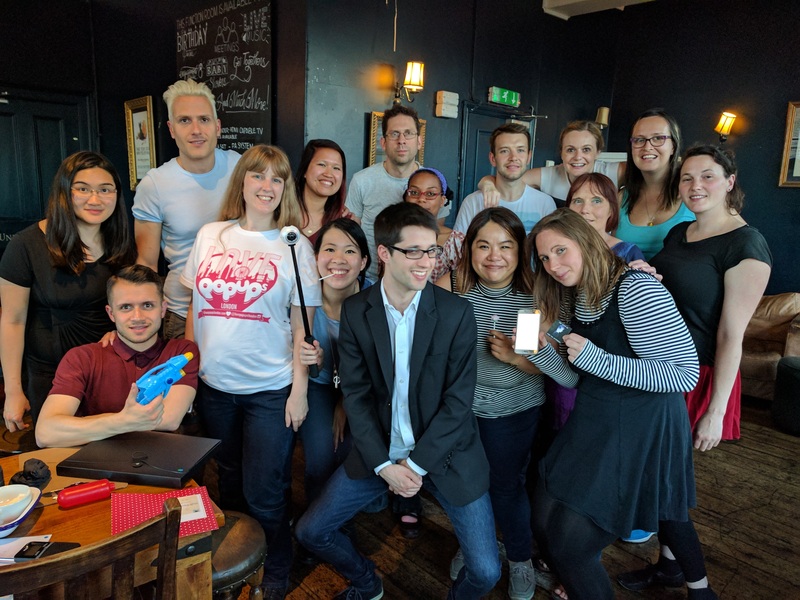 Thanks to Aftermarth who came down and let some of us from Love Pop Ups London a great immersive murder mystery challenge game to solve. Read our blogs/reviews from the comments below. Love an escspe room and murder mystery? Well this is the game for you! It’s an escape room with a murder mystety twist!!! They come to you so its a private event, its best to have a bigger group of people, great for birthdays, hen or stag dos and just groups of people that want to catch up with eachother. Its quite a complex event with alot of clues, puzzles and different platforms of information. You need to not only solve the game but also work out the key points along the way. You will be guided if you need it but the key to this is working as a team and becoming one unit to solve this puzzle. They also put the top 3 teams that complete this task in a good amount of time into a hat at the end of the year and one team will be invited back to try and complete another challenge. I really enjoyed this event and how different it is to other escape the rooms i have done, they have various locks and forms,of information and its very clever how its pieced together. Aftermath, a game very different to your usual escape room concept. A game that is best suited to a large group of people where communication and working together as a team is very much the heart of what makes this game successful. Without giving away too much, there is alot of objects which needs to be gone through thoroughly and attention to detail is key here as nothing is left to chance. This game is ideal for team building exercises and an activity that makes you think outside the box. However in some cases you may need to think far far outside the box. Nevertheless the concept is great but if communication is not done then that can be you and your teams ultimate downfall. Having this venue in a pub upstairs room helps space out the amount of objects that needs inspecting and also disperse the crowds of people around one area. Again an immersive experience that’s a change from your typical team building exercises. Enjoy being trapped in a room with a complex and intriguing murder case to solve – look no further to Aftermath to fulfill all your inner detective needs. The game comes to you for any occasion and only requires a space to lay some items down to set the scene and start the case. Some aspects I found required you to think too far out of the box. Also I found that is it essential to work as a team and communicate effectively otherwise you will miss vital clues that will help with the end part of the game. Being question at the end really brought that home as I was confused in the end as to where the answers came from. Overall I think this is a good game and would really recommend it to those who wish to unleash their inner detective. But if your looking for something based on the escape room\ immersive concept this has it covered but believe there are better out there for a fuller experience. Had the chance to play this game thanks to @lovepopupslondon. A pro-active puzzle solving game where you and your team mates impersonate detectives that need to find a key witness in hiding. While I enjoyed playing this game I thought it was quite hard to understand the bigger picture of it. We were about 12 people and for me it was maybe too big of a group for the game. I would advise a 8 to 10 people group for an easier organisation and team work. I would highly recommend this game for a team building corporate event as it forces to works on your communication, organisational and logistic skills! Looking for a different kind of immersive experience? An escape game with a murder twist? An interesting more story line based take on the concept of an escape room game. You have various locked items and documents, emails and devices, which are used to find information in order to unlock items and discover more about the suspicious death of a Polish-born news reporter. Whilst it can be difficult to allow everyone to have equal interaction and communication in such a large group of players overall I found the game to be an enjoyable experience. More than other games of this kind it requires you to pay attention to the the plot aspects of the game rather than simply solve puzzles. If you are looking for a more traditional escape room game you may find this is not as appealing but if you don’t mind something a little different from the regular concept this will be to your liking. Aftermath is an escape room with a difference. Aftermath is the immersive experience that comes to you. Personally, I find that it’s half escape room and half murder mystery. We played this game with 12 people, and I think there were a bit too many people, but it’s because we all were preoccupied with breaking all the codes and locks but not collecting backstory. You arrived with a locked suitcase and evidence that you need to open to gain more information on what happened, and if you’re successful you are saving the world from the ‘aftermath’. As I said, we didn’t know the extent of questioning that would happen after the game. We thought all we had to answer was, ‘what are we saving the world from?’ and we had that answer. Since we were focussed on just solving it like a usual escape room (without necessarily trying to get deeper into the backstory), there was little to do for 12 people. Even if you do the usual pairing where 2 people are set to task, there were way too many clues and pieces of the puzzle and way too many people. Perhaps a group of 8 people would be more ideal as you would be able to organize yourselves better and communicate better. Or maybe you can bump it to 10 people where 2 people are assigned to collect as much info about what happened, so that you are ready for questioning. It would really have helped if we knew the questions we were going to be asked after so that we would know what we are trying to find. Nevertheless, it was unique experience an found it a good way to spend Friday evening. It’s a game that comes to you, as long as you have a room big enough to contain it and the cost of the game depends on the size of your grop. The story is based on a political conspiracy and a reporter (Emilia Sarnowska) has been murdered. You have to solve her murder, find out why and do all of this in 90 minutes.